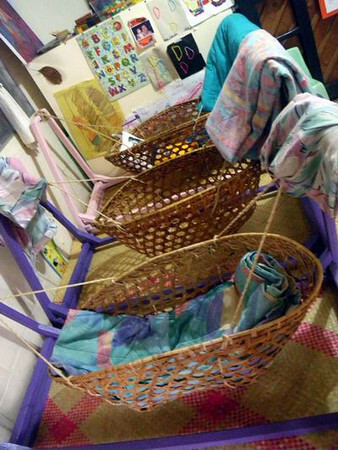 Arugaan Day Care is a ten-hour creche operated by Innes Fernandez, a staunch advocate of breastfeeding and going back to our Filipino roots of eating, learning and being a family. 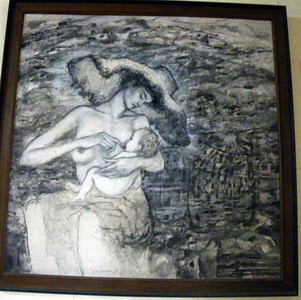 It was started with PIA before but is now moved to Nanay Innes' Marikina home. It's a very cozy place, much like a home really. 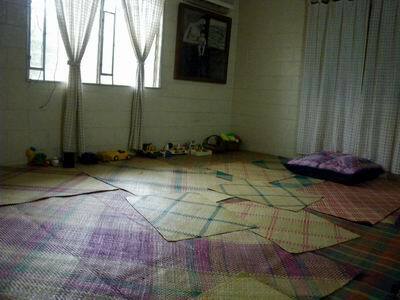 Its yard is not that big, just enough for a small holding area for the chicken, a duhat tree, and some plants. There's an area (tiled with potty and urinal at the side for potty training) where inflatable pools or batyas are set up for water play. When not busy with her speaking engagements and advocacies, Nanay Innes herself initiates all the singing and dancing. Songs I used to sing from my old Sunday School classes came flooding back. It's really back to our Filipino roots with Nanay there. And there are a lot of veggies I don't eat but Nanay Innes got me to love the puso ng saging bistek style that she served. They also only serve brown rice. This is perfect for those living in Marikina who want to be rest assured their kids are in good company and eating well while the parents are away. This is also an ideal place to have the child and yaya hang out, so parents can relax and not fear their child is being abused or neglected during the day. I really highly recommend this Day Care. Nanay Innes is also all for "franchising" the day care, for those who want to put up their own under the same guiding principles and working vision. I don't think it's for income generation though, because Nanay Innes really charges cheap (but you better ask what their monthly rate now is). I was told that both child and yaya are entitled to four meals each day for the monthly rate. Most of the toys are pre-loved items by Nanay Innes' grandchild and though there are also fancy toys there, Nanay prefers reused and recycled items plus such ones that she can use along with the songs she teaches the kids. (She has these miniature animals she pulls out of a bag when singing a Tagalog animal song, she arranges plastic chairs when singing something about riding a jeepand someone does 'collect' the fare and such). More enrollees at the creche would mean more kids having fun and learning from each other. 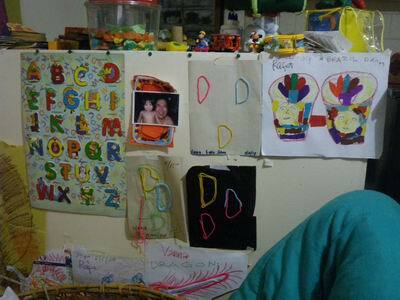 More yayas will have fun too (they even like putting their names in their art projects, just like kids). I wish i discovered such a beautiful haven like this for my babies just before my first born turned 2 years and 4 months now..and my 2nd born 8 months..but i guess, it's never too late, i will surely meet nanay ines really soon and bring my child children to grow and learn there. thank you for the vision and mission nanay ines!